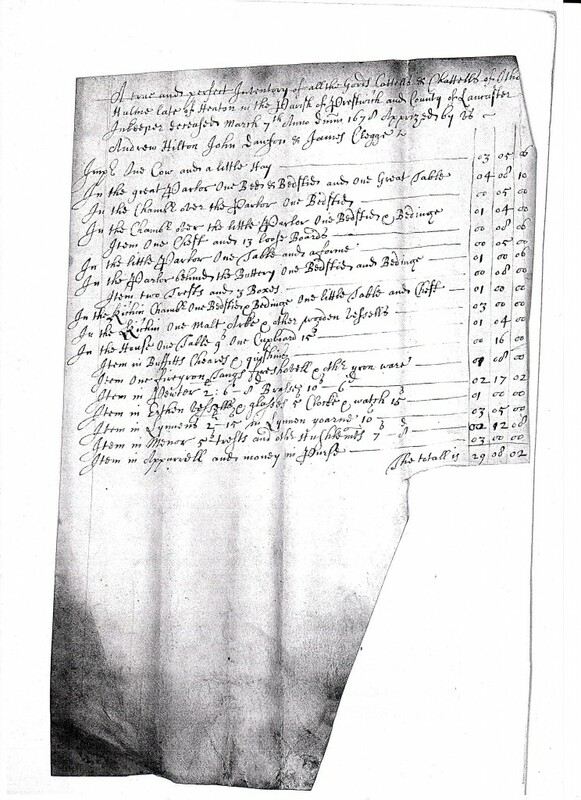 The Inventory of Innkeeper Otho Hulme 1679. Below is a list of Wills and Inventories of Prestwich people between 1536 and 1834. These are from the Chester Diocese Consistory Courts where Wills from this area had to be proved . The Wills and other documents are now in Lancashire Record Office, Preston. Copies of the originals can be obtained for a small fee. 2. Infra – the Diocese of Chester kept a separate list of Wills with a total bequest of less than £40 and called them “Infra ” Wills. They were less important and took up less time to deal with. 3. The column called Index refers to the volume of the published Wills Indexes of the Record Society of Lancashire and Cheshire. Inventories were a list of the property of the deceased person. Inventories are sometimes listed room by room, giving a description of the actual house. Inventories were particularly common in the period 1500 to 1750. A similar list for Whitefield Wills can be found in the List of Bury Wills, 1545 -1780, compiled by Bury Family History Society and available in Bury Local History Library. Date Name Comment 1 Comment 2 Index Vol. Month Parish Reg. I was hoping to find information regarding Johanis Bradshaw’s parents, born 1678 he married Elizabeth Dawson born 1678. I too was looking for info on Johanis Bradshaw and Elizabeth Dawson. Please get in touch if you see this. Johanis and Elizabeth were my 8th great grandparents. Haven’t got any further than that but would love to hear from you. miranda_davey@yahoo.co.uk. John Bradshaw married Elizabeth Dawson in 1696. John was a weaver who lived in Whitefield. He died in 1724 and his widow, Elizabeth, apparently died in 1760. Check out the online Parish Registers for Prestwich for lots of Bradshaws from 1700 onwards …. (Link to the online Parish Registers of Prestwich in our Genealogy section ). Thank you for the information you supplied, I have a lot of information but have drawn a blank with Johanis’s parents etc. I have visited Prestwich Parish Church where Johanis is reported to be buried but couldn’t find anything. Thank you again. “Bradshaw” is a place in Bolton so you might try the Parish Registers for Deane, Bolton-le-Moors, Bury and Radcliffe for your John Bradshaw born about 1670. I have recently found through DNA research that I am related to this line of Bradshaw’s. Ironically, this connection was made through a family in Australia. They evidently migrated from Lancashire to Australia in the 1900’s. The farthest I had gotten before was South Carlina, USA in the late 1700’s. The DNA indicates that the tie between the lines is several generations prior to Johanis. I would love to find out more about this family. It is a bit difficult for me to do direct research from Virginia, USA. I am very interested in corresponding with researchers in the UK. Thank you for any assistance you might be able to give. I am looking for information on a john proudman born 1854 He was my great grandfarther. There is no Proudman family in Prestwich in the 1851 Census. And very few records in the Parish Registers of St. Mary’s Prestwich. Two baptisms are recorded in the 1880s to a John Edward Proudman/Prowdman who was a gardener from Rainsough …. I just thought i’d write this in the hopes of finding a few Whitehead’s that lived in Prestwich, in and around the parish of St Mary’s.I do know a few of my Whitehead’s were babtised in the parish of St Mary’s. My 3 times great grandfather John Whitehead (b. c1805)lived in the Bradford area of Manchester, where many of my Whitehead’s lived and worked. 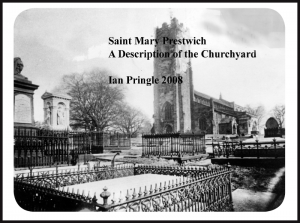 I have found connections with the Parish of St Mary’s, Prestwich. If anyone reading this message would like to contact me, please do so and I would be very pleased to hear from you. Looking for information on my 3xGrt Grandparents; John & Ann Briggs from either Little Heaton or Pilkington. John born~1791, and Ann born 1790-96?. John was the son of Robert & Phillis Briggs[nee:Thorp/Thorpe]. They appear on the 1851, & 1861 Census, but what about the years before that? When/where were they married? Children? Ann’s family name pre-marriage? Any other information please. Occupation on the 1841 census is Beer seller though on the above baptisms it is listed as tailor. Occupation of father of both children is Tailor. As for date of marriage, best I can come up with is 10 Sep 1810 St Marys, Oldham John Briggs, tailor from Unsworth marries Ann Redford, spinster from Unsworth, witnesses Jonathon Jackson and William Redford (possible lead for you to follow up). Neighbour on the 1841 census is Isaac Briggs, bricklayer and his family, likely to be a relative. I too am trying to track a John and Ann Briggs of similar ages to yours. My ancestor is Isaacher Briggs, who has been relatively easy to track due to the odd name. He was born in 1815 and baptised in Middleton St Leonard – parents John and Ann. He then married in 1836 in Bury St Mary, and seems to have settled in Pilkington. It seems he may have been a tailor also, so the Ann and John above look promising. thanks. There was a Susannah Briggs as witness at Isaachar’s wedding but no idea what kind of relative. Have traced all family to 17th C and established that most now occupy a spot in the vast open spaces of St Mary’s Prestwich. Have written to the Church folk but not received a reply [ perhaps not surprisingly ] as to whether there exists, somewhere, some semblance of grave order for even a trace of one or two ancestors. Grateful if anyone can help. Not sure this helps but Martha Smethurst married my relative William Booth on 31stOct 1771. In neighbouring Eccles Unfortunate I cannot find previous history for Martha- wondered whether you can help. I have been to the St Mary’s myself today, on a similar mission, looking for the grave of my great grandfather x5. I looked at various lists and scrolls with the church warden but found it all very confusing as the references on the lists could not be found on the scrolls! I came away very disappointed. I would suggest you ring up the warden. The phone number is on their website. I am looking for any records of two people.namely my Aunt & Uncle.they are NORA(H) and STEPHEN MINTERN.they wre born in Cork.Ireland.circa:1896/1902,for NORA.and circa:1903/1907.to STEPHEN and ELLEN MINTERN.on their mother`s death.circa:1911.the family was split.I believe Nora & Stephen,were sent to the Bury/Prestwick area to be taken care of by relaative`s.likewise.other brothers.PATRICK and ANTHONY-LEO. (my Father)were intern sent to Kent.hence later in life met my Mother.and so on.circa:1919.NORA married ANDREW DINEEN.then they returned to Cork.and raised a family.what I`m looking for is any record`s on them from the time they arrived in Lanc`s.especially Stephen.ie.what he did or where he went.and what happened to him.if I recall,we knew him as Christie.(Christopher? )when we were children.as my middle name is Christopher.anyone know anything.or where I can find any fact`s….Thank`s. I was hoping to find some info on my Great Grandfather, John William Foster and his spouse, Nellie Ke(n/r)shaw. I am trying to research information about my ancestors – the Wood and Walkden families. They lived on Rooden Lane, Prestwich and there is a connection with St. Mary’s where I have found some church records relating to them.